The ESA Rosetta Mission, launched in March 2004, rendezvoused with comet 67P/C-G in August 2014. The lander Philae touched down on the comet on 12 November and came to rest after bouncing twice (the harpoon tethers and cold gas retro-jet failed to fire). 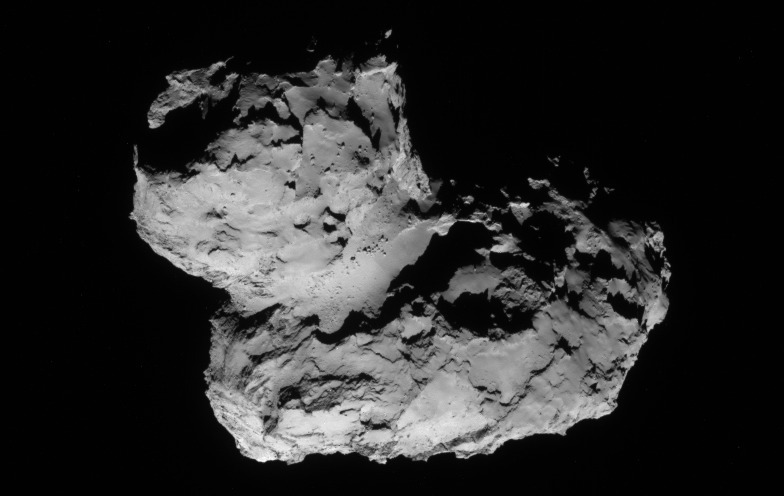 Comet 67P/Churyumov-Gerasimenko on 11 August 2014. The landing site is on the smaller knob, near the top of the image. Photo copyright ESA. Rosetta was in orbit around the comet and, after detatchment, the lander Philae was put in free fall, dropping onto the surface from a height of about 20 km in about 7 hours. It’s speed on impact was about 1 m/s. We will have a look at the motion of Philae in the weak gravitational field of the comet and see if these numbers can be produced by simple mechanical reasoning. For objects close to the Earth’s surface, the acceleration due to gravity is approximately constant. Newton’s law implies a force for an object of mass . Here (SI units), is the mass of the Earth and is the distance from its centre. We take to have a constant value equal to the mean radius of Earth. Then the acceleration is . For simplicity let’s take (SI units throughout). Consider an object falling from a height at time 0 to the surface at time . From elementary mechanics, the speed at the surface is . The distance travelled is . Juggling these equations, the time of the fall is and the speed on impact is . Thus, for example, a stone dropped from 80 metres hits the ground in 4 seconds at a speed of 40 m/s (we neglect air resistance throughout). When the variation of distance from the centre of attraction is large, we cannot assume that is constant, and we have to integrate the equation of motion . Multiplying by and integrating gives the equation where is a constant. Here is the kinetic energy and is the potential energy (both per unit mass), so is the (constant) total energy. Now let us apply these formulae to Philae falling towards 67P. Some relevant data: the comet mass is kg with density of about 400 kg/m³. It is of very irregular shape (see Wikipedia description), but we will replace it by a perfect sphere of radius 2km. Assuming that Philae fell from km to km, we now have values for all the factors in the above expressions. Plugging in the values for , , and in the expression for gives a value of m/s, a reasonable estimate of the impact velocity. Now plugging the parameter values into the expression for , we get an estimate of the fall time, hours. This is much longer than the reported 7 hours. where . Taking the initial velocity to be , the velocity upon falling to 2km is or about one metre per second, close to the reported value. Integrating from the release point to the surface, the time of fall now comes to almost exactly 7 hours, in agreement with the reported value. We note that the lander has accelerated by only a tiny amount, from 0.65m/s to 1.01m/s, in the weak gravitational field of comet 67P. An object with negative energy is held in orbit around the attracting body. If the energy is positive, then the object can escape from orbit. The minimum escape velocity is found by setting . For Philae, the energy was . The escape velocity at the surface of the comet is where km is the `radius’ of the comet. Plugging in the values given above, we get m/s. Since Philae fell from a great height, the lander was close to escape velocity, and measures were taken to ensure that it remained on the surface. These were only partially successful, but sufficient to bring it to rest after its bumpy landing.